Current UM students, alumni, and faculty are invited to submit work of any genre and length. There is no limit to the number of films that any individual may submit. Filmmakers should email both a link to each film and its password to Alan Arrivée (arrivee@olemiss.edu). All work submitted will be considered for festival awards. Categories for awards to be determined by the quality of the work submitted. Up to $500 will be awarded. Artists interested in submitting poster designs to be considered for this year’s festival advertising should attach a high-quality color image of their artwork in an email to Alan Arrivée (arrivee@olemiss.edu). 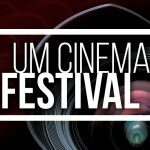 Information on the poster should include only : 2018 UM Film Festival. Poster may be signed. All other festival information will be included in the general design over black bars at the top and bottom of the poster. Winning designer will receive $100 and artwork credit. 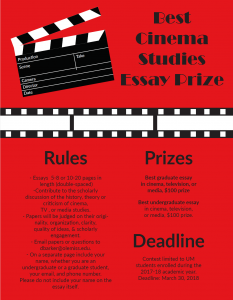 Essays should be 5-8 or 10-20 pages (double spaced), and contribute to the scholarly discussion of the history, theory, or criticism of cinema, television, or media studies. Papers will be judged on their originality, organization, quality of ideas, and scholarly engagement. Contest is limited to UM students enrolled during the previous academic year. Email papers or questions to Deborah Barker, dbarker@olemiss.edu. On a separate page, include your name, whether you are an undergraduate or graduate student, your email, and phone number on a separate page. Please do not include your name on the essay itself. A program of short films written and produced by students, faculty, staff, and alumni of the The University of Mississippi community.